I used to incessantly watch Whitney Houston's "I Wanna Dance With Somebody" music video when I was kid. I loved her big, fluffy skirt in the video but I loved the song even more. My tastes in music has broadened since then, but music does remain a major part of my life. I used to play bass, I want a ukulele, and I'm married to a musician. Whenever I edit one of my video blogs (even a pointless one about hamburgers!) I spend an inordinate amount of time trying to pick out the perfect song for it. Austin is an incredible place for music. It isn't called the "Live Music Capital of the World" for nothing! Since moving here four years ago Hubs and I have made friends with so many musicians, and it's one of the reasons why I love this creative city so much. One such musicians we've had the pleasure of getting to know is Miranda Dodson. Since meeting last fall, we've become good friends and she's been a huge supporter of Adored Austin. 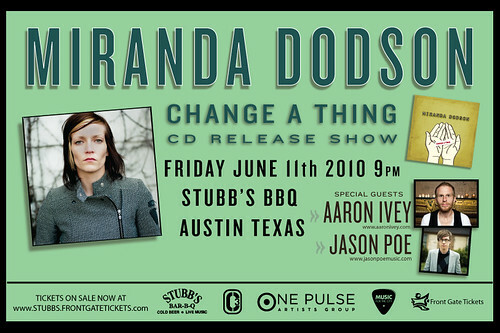 I plan to go to her big CD release party tomorrow night at Stubb's and I wanted to spread the word about it here. Miranda's single "Too Late" was the song of the day on KUT yesterday, and you can download it for free on the Texas Music Matters page. Tickets here or $10 at the door. It should be an amazing show. Plus everyone there will be dressed really awesome in that "I'm not really trying/ I just look this cool naturally/ I'm an Austin musician" sort of way. I'm feeling some street style photos coming up, aren't you? Hey, how's the man makeover going?